To all who came along to The Guild of Blessed Titus Brandsma's meeting at Our Lady of the Rosary, thank you and well done. Thank you to Fr Tim Finigan of Our Lady of the Rosary for hosting the Guild and to Defende Nos in Praelio and family for cooking lunch. It was my first time in chairing any meeting so I was a little nervous. Still, this is no excuse for forgetting to thank the individual who went under the name of A Reluctant Sinner for his wonderful work in setting up and managing the Guild for so long. Mea culpa. Thank you to Richard Collins for doing so and speaking on our behalf. We were also treated to a great presentation by Dr Adrian Treloar, who I would also like to thank for his excellent presentation on the miracles of Lourdes. The next Guild meeting will, I hope, take place during the Summer of 2014 and it would be marvellous if we could time the meeting for around the time of the Feast of Blessed Titus on 27 July 2014. I see that 26 July 2014 will be a Saturday and the meeting location, it was agreed, would be Brighton, so watch this space as we plan to meet next year. It was a joy to have bloggers, as well as commenters, at the Guild meeting as well also as those who use Facebook and Twitter to promote the Catholic Faith. We form a small, if creative, minority who endeavour to spread the Faith of Christ using the new media in our contribution to the New Evangelisation called for by a string of wonderful and holy Pontiffs. Communication between Guild members is, I would say, sadly irregular, though we may already be friends with each other on Facebook. Our own commitments in terms of writing, blogging and the various commitments that exist within our individual lives make the ability of Guild members to communicate with each other regularly quite difficult - hence why we meet a few times a year. I have set up a Facebook group for the Guild and though this was not discussed at the meeting, I hope that it would serve as a helpful tool in exchanging ideas and thoughts on the progress of the Guild, as well as a form of communication between Guild members. Though the Guild in no way forms any kind of 'secret society', the Guild deserves a measure of confidentiality and sensitivity in communication, as any meeting would have behind closed doors. For this reason, I have set the Guild's Facebook Group to 'closed'. This may change in the future depending upon the agreement and thought of Guild members. I have invited a few people, but invite those who were present at the latest meeting, those who are already in the Guild and those who seek membership in the Guild of Blessed Titus Brandsma to contact me either by Facebook or by email at englandsgardens@googlemail.com so that I can invite them to share in the exchange of ideas that are generated by The Guild of Blessed Titus Brandsma. It goes without saying that there is but one policy for the Facebook page of Guild members and that is 'charity in all things'. If there should be any personal disputes between members of the Guild which find their place on Twitter etc, then they are asked to leave these at the door of the Facebook page when they enter. No to in-fighting! Yes to fraternal charity! Without wishing to sound like a headmaster, if I see any fighting in the Guild on the Facebook page, people will be 'disinvited' from the Group. The Facebook page will hopefully serve as a point of contact between members of the Guild, as well as an interesting forum for relevant articles and blogposts that people may wish to put up for the eyes of the Guild. 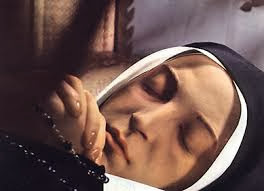 Once again, as I said in the meeting, the Guild's website and blog forms a good introduction to the work of Catholic bloggers using the internet to evangelise a World so in need of Our Lord Jesus Christ and His Holy Catholic Church. I would encourage Guild members, bloggers, as well as those who comment on various blogs to submit articles they believe would be suitable for the website, whether they be old or new, since the Guild's website is a useful 'introduction' to the world of Catholic blogging. Anyone who would like to submit an article for publication on the blog, email me, the Chairman at englandsgardens@googlemail.com. Well done again to everyone who attended and assisted in the meeting. I hope that in time, we shall attract more Catholics to The Guild of Blessed Titus Brandsma. Finally, since some of the Guild have received news of her situation, I ask for prayers for Supertradmum, a consistently excellent and prolific writer for the Guild. You remain in our prayers. I encourage and indeed urge all Catholic writers faithful to the Magisterium to join the Guild, whether they be 'small' or 'great' in terms of profile, readership etc. As Catholic writers and bloggers, commenters, Twitterers and communicators of the Gospel, we live in times of latent if palpable persecution and there is no doubt that during the age in which we live will we shall see hatred for the Faith of Christ become more and more apparent, as secularisation of our culture excludes more and more the God concept from its public discourse. 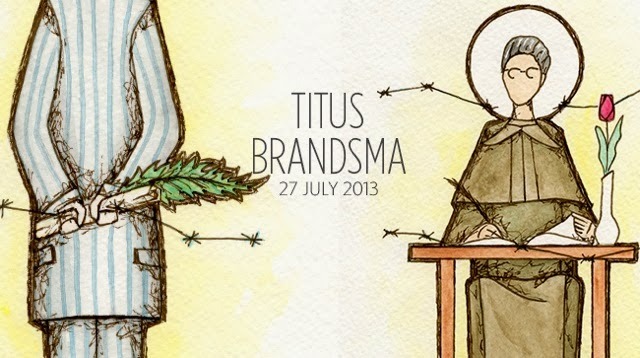 Blessed Titus Brandsma, pray for us. How many members have blogs? Do you have a logo that blogger members can put on their blogs?